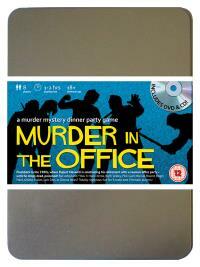 You've been invited to play the role of GOLDIE BULLET in Murder In The Office. Who killed the boss? Everyone has stayed after work to attend Rupert Maxwell’s retirement party. Not because they like him, but because they want to make sure he is really going, once and for all. With no expense spared, his P.A. has organised an Eighties throwback disco and the cheapest bubbly money can buy - but just as the party starts the bloated M.D. falls down dead. Find out who made Maxwell’s party a real choker! HR officer (she has a smile for everyone, and maybe more!) Costume : Flamboyantly coloured trousers and blouse mirror your bubbly persona, as do your mind-boggling earrings. You regularly carry sweets with you to treat good employees, and a ruler to reprimand the bad ones. In your mid-twenties, you are full of life and ready for anything. You describe yourself as a “people-person” so your job in human resources suits you down to the ground. You love helping people and maintaining workforce morale is the most important part of your job. Your ambition is to run your own dating agency as you’re always trying to hook up people you know.